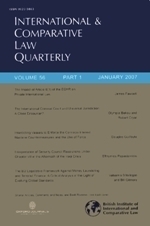 The first issue of International and Comparative Law Quarterly for 2014 includes several pieces on private international law. This article considers points of connection and coherence between and among the Rome I Regulation, the Rome II Regulation, and Regulation 1215, and relevant predecessor instruments. The degree of consistency in aim, design and detail of conflict of laws rules is examined, vertically (between/among consecutive instruments) and horizontally (across cognate instruments). Symbiosis between instruments is explored, as is the interrelationship between choice of court and choice of law. Disadvantaged parties, and the cohesiveness of their treatment under the Regulations, receive particular attention. The Moçambique rule provides that an English court may not adjudicate on title to foreign immovable property. This article considers the primary exception to that rule: where the court assumes jurisdiction in personam to enforce a contractual or equitable claim concerning foreign immovable property against a defendant subject to the court’s personal jurisdiction. It addresses two questions: how should the English court decide whether to assume jurisdiction in relation to foreign land, and if the positions are reversed, should an English court recognize or enforce the order of a foreign court affecting English land? As to the first question, this article argues that the orthodox English approach is anachronistic. English law applies the lex fori exclusively to determine whether an obligation exists which the court has jurisdiction to enforce. Instead, modern conflict of laws principles demand that the court should apply the proper law of the substantive claim in determining whether a sufficient equitable or contractual obligation exists. As to the second question, this article argues that despite the prevailing view that foreign non-money judgments are not enforceable in England, foreign orders in relation to English land are in principle entitled to recognition in a subsequent action in England by the successful claimant. The common law rules for recognition and enforcement of foreign judgments were radically reformulated by the Canadian Supreme Court in Beals v Saldanha. Few other common law jurisdictions have considered whether or not to follow Canada in this development in private International Law. In 2012, the Irish Supreme Court definitively rejected the Canadian approach. This note examines the judgment in that case, and assesses the reasoning of the Irish Court.